Known as the first true pass rusher alongside Doug Atkins, Gino was ahead of his time. He was adept at stopping the run, but best know for his pass rushing techniques. 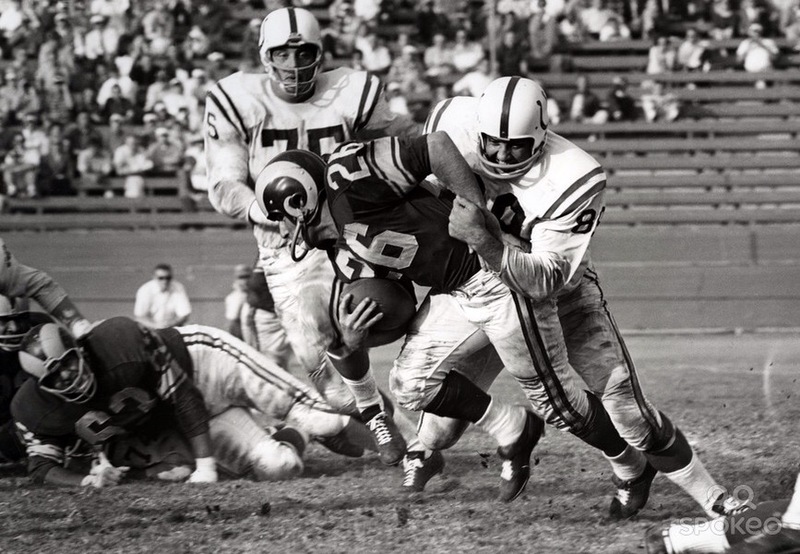 Teams used to double team and sometimes even triple team Gino but to no avail, as the rest of the Colts defensive line would step up and make a play. If there was a sack stat during his time, then we would know more about how well he rushed the passer, but sadly, the sack stat didn’t come into existence until 1982. Peppers came in with a lot of hype. 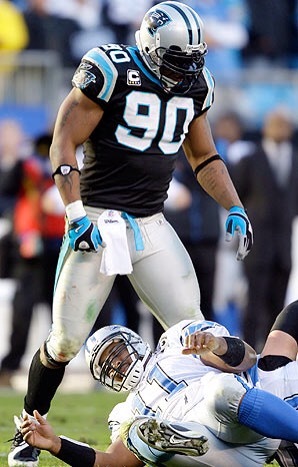 Some may say he hasn’t completely lived up to it do to his inconsistency, but when this man had good years he had dominating good years.For the Panthers in 2004, Peppers recorded 11.0 sacks, 2 interceptions, 9 pass deflections, and 2 defensive touchdowns. If it wasn’t for the greatness of Ed Reed, he could have easily won NFL Defensive Player of the Year. Peppers could effect the game in various ways whether it was stopping the run, rushing the passer, or dropping into coverage. If he could have done those things on a more consistent basis, then he would be higher on this list. 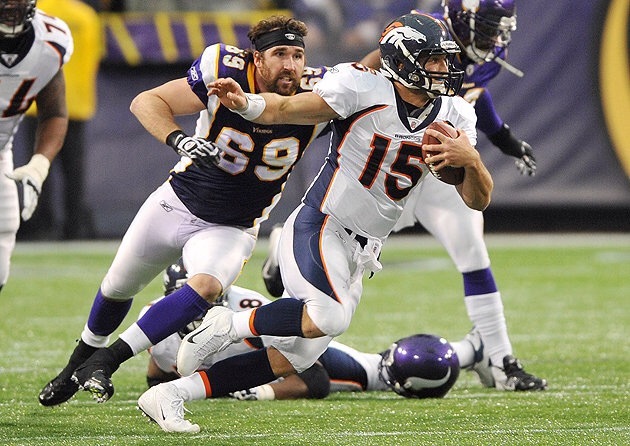 Jared Allen is the best defensive end I’ve been able to fully watch as his career has unfolded. He almost went 9 straight years with 10 sacks each year but came a little short in 2006. Allen started his career in Kansas City, but he was able to truly take off when he became a Viking in 2007; recording 15.5 sacks his first year in Minnesota. I will always remember Allen for his playoff game against the Cowboys. His stats were not outstanding, but it seemed like on every single play, he was in the backfield in Romo’s face causing havoc. 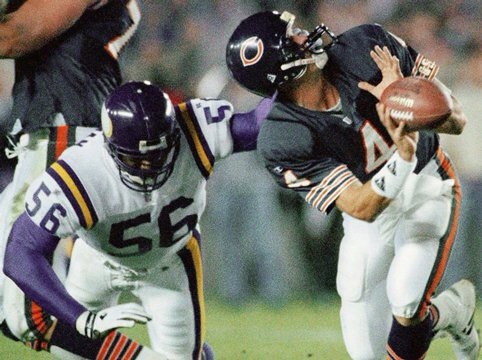 As of today he is 9th all time in career sacks and playing for the Chicago Bears. Recording one of the best seasons ever by an end with 21 sacks in 1989, Doleman gave O-Lines hell. Doleman, as physical as he was, only missed two games his entire 15 year career. He is 4th all time in career sacks with 150.5. You could argue for him to be higher on this list if you only looked at the stats, because as a straight pass rusher, he has an argument as a top 5 guy. This is another guy that’s hard to show his impact on the game because of there being no sack stat in existence. He battled injuries at the beginning of his career but by 1978 he found his groove. 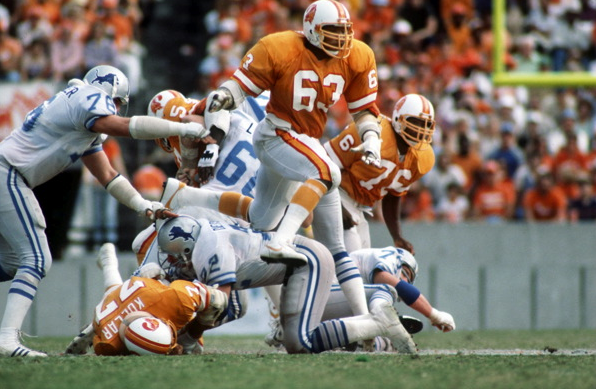 He was named to five All-Pro teams, was named the NFC defensive lineman of the year four times, and won defensive player of the year in 1979. A back injury in 1985 caused a premature end to what could have been an even greater career than it already was. I like to compare JJ Watt to Howie Long. 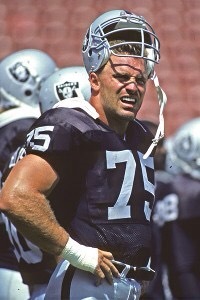 Howie Long was a rare case of overall speed, size, strength, and quickness. He was an essential piece to a championship Oakland Raiders team. He was able to affect games in all kinds of ways. He was also a member of 5 all pro teams and collected over 84 sacks. It’s hard to describe how good he was. There wasn’t a sack stat until 1982. He was 6’8 playing defensive end. He used to leapfrog defenders…..at 6’8. Atkins revolutionized the position along with Gino Marchetti. He was best at batting down the ball at the line of scrimmage and causing all kinds of havoc no matter if it was against the run or the pass. 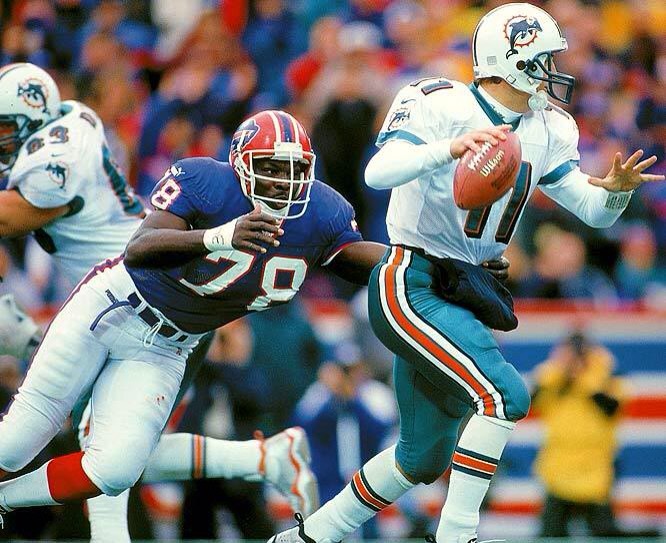 Bruce Smith made a living of abusing offensive lines. He’s the all time leader in sacks with 200, has two defensive player of the year awards, and has been selected to 11 all pro teams. You could make a case for Smith to be at the top of this list because he dominated for such a long period of time, and didn’t really experience any down years until the end of his career. Deacon’s numbers aren’t great but that’s in part to the fact sacks weren’t recorded until 1982. Deacon was the one that actually came up with the term “sack”. 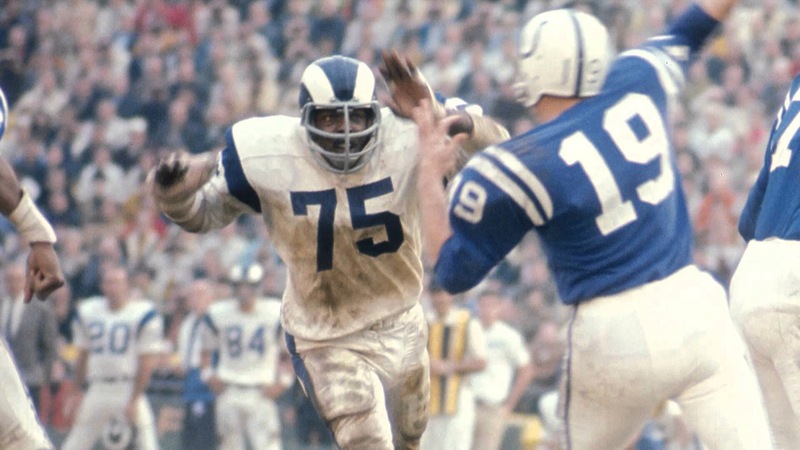 According to Deacon he had 20 sacks in 1963, 26 sacks in 1967, and 24 sacks in 1968. Regardless of the validity of those statistics, Deacon was an unstoppable force on defense. 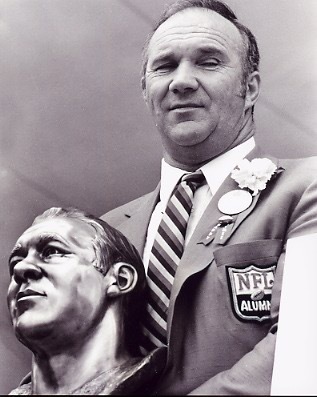 He was the leader for arguably the greatest defensive line in NFL history, the Fearsome Foursome. Nobody can convince me of a better pass rusher than Reggie White. He absolutely abused any man in his way to the QB. He has two defensive player of the year awards, 198 sacks (second all time), and a super bowl ring. He was huge in that super bowl championship; as he was in Drew Bledsoe’s face the entire game. Most of his stat stuffing years were in Philadelphia with the Eagles. From 1985 to 1993 he only had one season with less than 13 sacks, and even then he had 11. 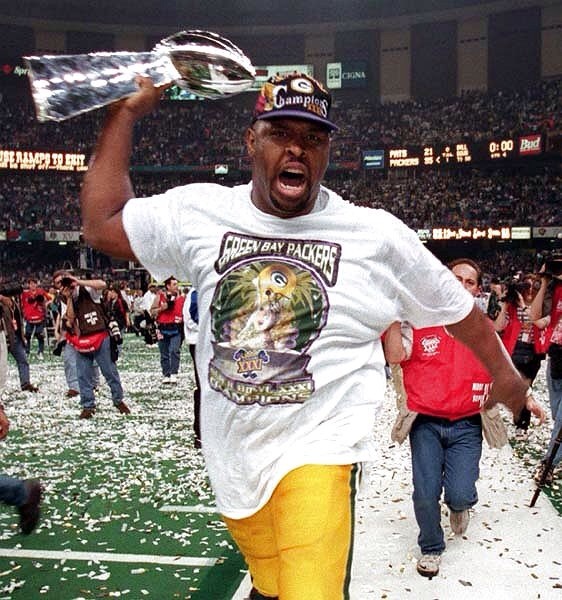 He was arguably the biggest free agent signed out of all of the years of the 1990s when he went to the Packers. Think about this. Reggie White had 198 sacks in a 15 year career which is second all-time. Kevin Greene in a 14 year career, who is 3rd on on the career sacks list, has 160 total sacks. That’s 30 more sacks White has over the guy one spot below him in career sacks. I want you to try and name anyone better because I sure can’t.